My post on Nespresso-compatible capsules has become unmanageable because of its too many updates. I myself cannot use it as a guide anymore! As I’ve discovered some more capsules, it’s time for a separate addendum. For a not-too-weak lungo: Gourmesso Lungo Latino Mezzo (7) — despite not being 100% Arabica! Note that they’re stupid enough at Gourmesso to write “Perù” instead of “Perú”–Germans are clueless when it comes to accented letters; most of the time, in this country you’ll see e.g. “20 Beutel á 1,5 g” instead of “20 Beutel à 1,5 g”! During my visit to Romania, I discovered some new brands of Nespresso-compatible capsules, most of them unavailable in Germany. First, Delhaize has a small range of espresso-only (no lungo!) capsules, individually packaged (what a waste to have a 155x90x75 mm box for 10 capsules! ): Brasil (strength 3), Ethiopia (strength 5), Colombia (strength 7), Indonesia (strength 9). They’re 2.85 € in Belgium (I forgot the price in Romania). I only purchased Colombia (7) and it’s quite good, although not necessarily my first choice: a bit too acid (they call it fruité). The capsules themselves are made of an ugly plastic resembling of Grandos Pronto. As the box of ten came to an end, I was sorry it didn’t last longer–this coffee is actually enjoyable. Auchan too has 4 types of capsules for Nespresso, and also at 2.85 € the box: Lungo (strength 5), Classico (strength 7), Expresso (strength 9), Fortissimo (strength 9). I’ve found them in a compact box (155x70x30 mm), not in the huge box depicted on their website. I opted for the only lungo they have, and I found it to be very decent: balanced, low in acidity, very drinkable. The capsule is similar to Kaufland’s Exquisit, i.e. it also has an aluminium back foil. Too bad Auchan doesn’t bring in Romania the capsules branded Carte Noire and L’OR (by Douwe Egberts). 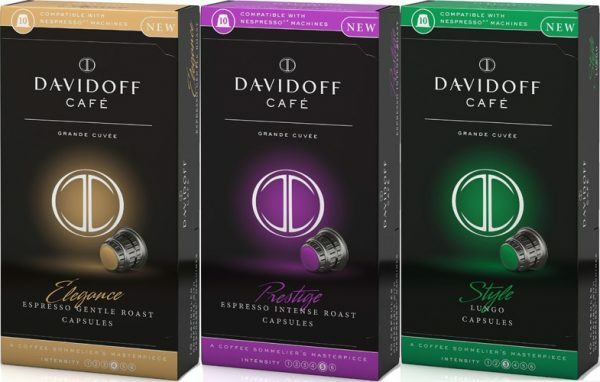 Still at Auchan, I found the capsules branded Davidoff, which are distributed in Romania by Tchibo (who actually makes the coffee), yet in Tchibo’s motherland I wasn’t able to find them in stores! They only have 3 kinds: Elegance (espresso, Arabica, strength 4/6), Prestige (espresso, Arabica and Robusta, strength 5/6), Style (lungo, Arabica, strength 3/6). As expected, I only tried the lungo variety, which happens to be excellent! Very low acidity, no bitterness, medium strength. The capsules have a tin back foil, for maximum compatibility. 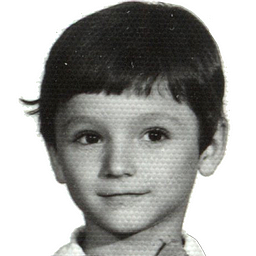 One caveat though: I liked it as is, black; my wife drank it with milk and sugar and she said it was crappy! Back in Germany, I discovered two things. First, that I ignored Starbucks’ own capsules. Their varieties don’t have a declared strength, only an indication on the roasting: blonde, medium, dark. 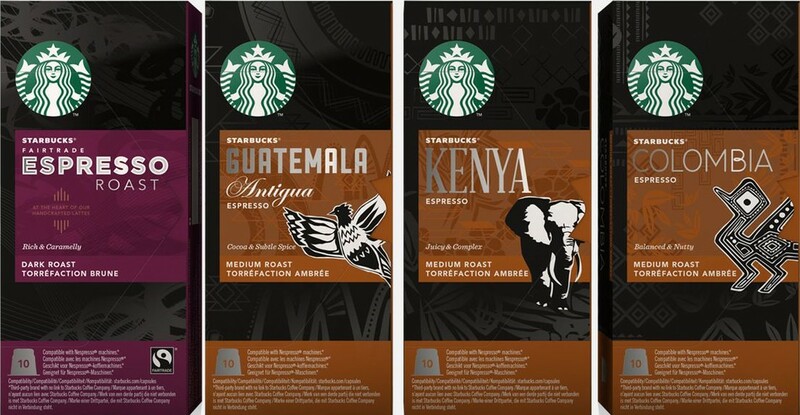 And they’re all for espresso or ristreto–no lungo: Guatemala Antigua (medium), Colombia (medium), Kenya (medium), Espresso Roast (dark). The online offer doesn’t include the 10-capsule packs that are available in their coffee shops, and it doesn’t list Kenya, not even in UK or France! On the other hand, in Germany and Austria the following varieties are missing: House Blend (lungo, medium), Decaf (dark), Blonde Espresso (blonde). Because I normally like Guatemala, I gave it a try and I found it to be utterly mediocre and lacking the aroma, despite having 5.5 g for 40 ml. Starbucks is definitely a highly overrated brand! Oh, and despite the back being of aluminium (somewhat similar to Dallmayr Capsa, but worse), the water flow is disappointing. The second discovery is that Dallmayr Capsa has just launched two new varieties of lungo: Crema d’Oro (strength 5/12) and Prodomo (strength 6/12). This is a definite improvement over the previous lungo offer, and it brings their number of varieties to 12. Despite both Crema d’Oro and Prodomo corresponding to Dallmayr varieties of regular coffee that I don’t fancy much, I’ve found both to be valid choices for those in quest of a different taste. I prefer Crema d’Oro, as Prodomo is stronger and with a higher acidity. There’s no clear indication on Crema d’Oro with regards to the type of coffee, but Prodomo is made of highland Arabicas, mostly from Ethiopia (which explains why I don’t quite like it). To be continued? Hopefully not! AUGUST UPDATE! You wouldn’t believe how many things can change in the Nespresso-compatible capsules field in such a short time! Dallmayr Capsa added two more varieties; not lungo, just espresso, both strength 5: Vanilla and Chocolat. I didn’t try them though. And the real shock: aluminium capsules from Jacobs! 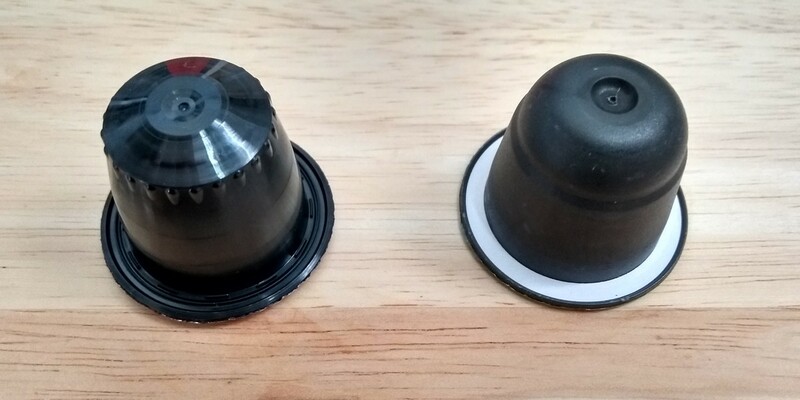 Practically nobody else but Nespresso uses aluminium for capsules. These capsules are of a very high quality, and without the occasional signs of poking shown by some Nespresso ones. Not only the capsules get punched very well, but the water flow is so fantastic, that the time to get a lungo* is shorter than with any other non-original capsule! The price: 2.49 € the pack of 10 capsules (at REWE), and 3.99 € the “value pack” of 20 capsules (at Kaufland). For aluminium capsules no less! As of yet, the espresso with strength 7 could not be found at REWE, Kaufland or ALDI SÜD–places where I’ve seen the new capsules. I was also shocked that I couldn’t resist purchasing such capsules, despite my usual dislike of Jacobs’ coffee: acidic because it’s always heavy on Robusta! EDIT: I have tried Lungo 8 intenso and it’s much better than the weaker lungo, as it has a lower acidity! 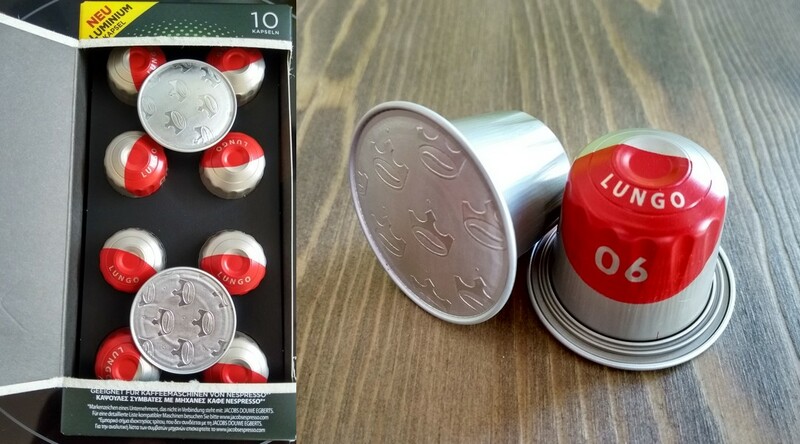 Strange thing, should you make it “extra-lungo” (say you press the button for lungo and then the button for espresso, using the same capsule), the amount of crema would amaze you! My new favorite espresso, this aluminium Jacobs Lungo 8. Espresso 10 intenso is also quite good. 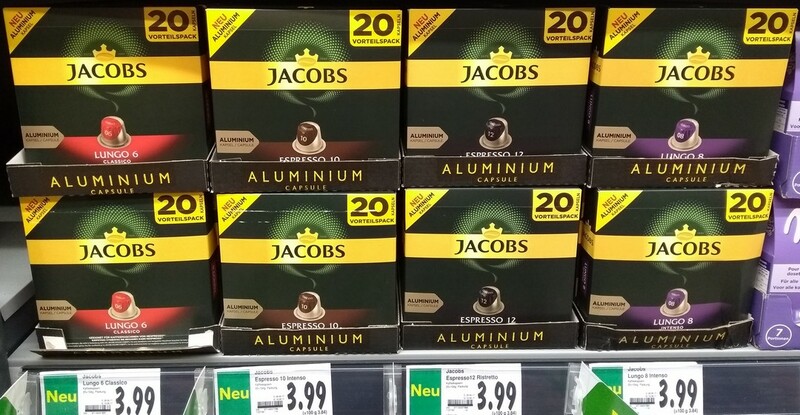 Of course Jacobs already had some Nespresso-compatible capsules, Jacobs Momente, but I refused to try them. The new, aluminium-made capsules have been reviewed by a German site; a reader commented that Douwe Egberts has released identical capsules under its own name in the Netherlands, and there’s no wonder–the German company is called Jacobs Douwe Egberts DE GmbH (Jacobs belonged to Mondelez International, but its coffee division merged with Douwe Egberts in 2015). The Douwe Egberts-branded capsules can be seen e.g. 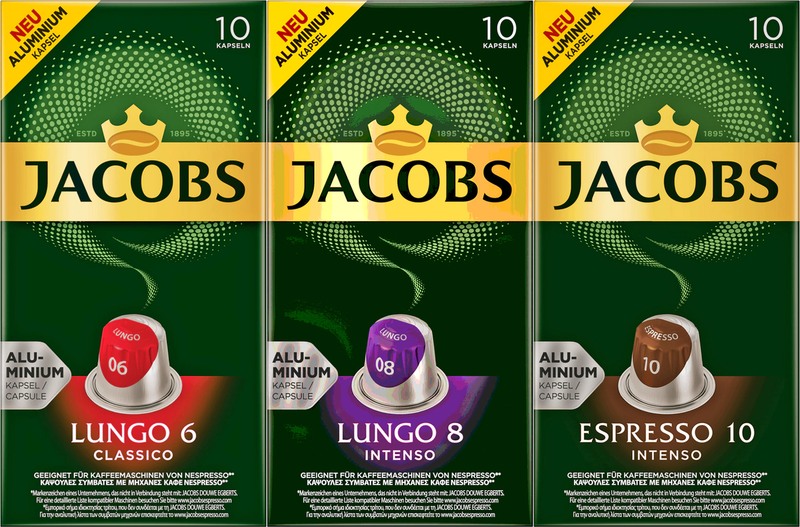 here, and there’s no surprise in finding identical Lungo 6, Lungo 8, Espresso 7 and Espresso 10 varieties; only Espresso 12 is temporarily missing, and Lungo 6 decaf is added to the range. Anyway, I don’t understand the German reviewer’s complaint that the new capsules are bitter and with a rather unpleasant aftertaste. No, the roast is not too dark–it’s just an espresso roast! I’ve tasted much, much bitterer espressos–and I mean really bitter, something these capsules are not! Oh, one more thing: the Senseo capsules made by the same Douwe Egberts seem to have disappeared from the discounters! They were of plastic all right, but they offered a larger choice: 9 varieties. The end-August shock: aluminium capsules from Jacobs!